Hooked on Needles: Rainbow Quilt wants YOU! 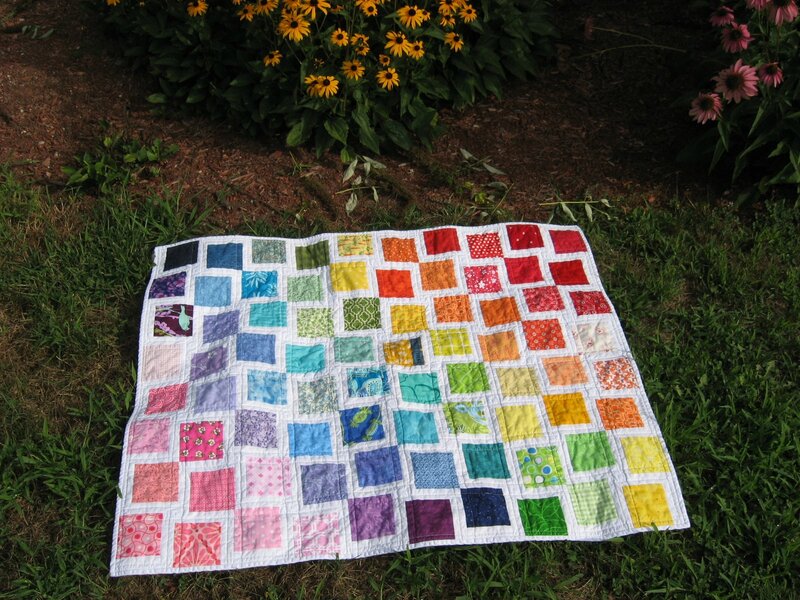 In case you haven't seen enough of my Rainbow Quilt recently, with THIS POST showing the original, and then THIS POST offering a lengthy picture tutorial so you can make your own, here is another place you can view my Rainbow Quilt: Quilting Gallery's weekly themed contest and this week the theme is Baby Quilts! I entered my rainbow quilt and sure would love to get your vote. So click on over and check out all the lovely baby quilts, which are listed in alphabetical order. After all the pictures, each quilt is listed by name with a little check box next to it. You can vote for up to 6 quilts for this contest. After checking up to 6 boxes (and I hope the box next to Rainbow Quilt is one of them! ), then go to the bottom of the list and click on the VOTE button. It's that easy! Contest ends Sunday at midnight so get a move on! Here's a picture of my Rainbow Quilt just so you know what to be on the lookout for! Thanks so much! I'll let you know if I win! You got my vote Mary Grace - good luck to you. It was fun looking at all these baby quilts! You sure are one lucky gal - first the fabric win and now the target card win! You deserve it - I always say what goes around, comes around. You are such a generous, caring person and you are being rewarded for all the good you do. Hope your rainbow quilt proves to be a winner. Done!~ You know I love this quilt! Good Luck!